Venue: Newcastle. Date: Sunday, 10 September. Coverage: Live on BBC One from 09.30am-1.30pm (BBC Two highlights 18:00-19:00) and live text commentary on the BBC Sport website and app. Britain's Mo Farah will aim for a record fourth consecutive Great North Run victory when he races in Newcastle on 10 September. The 34-year-old, who won 10,000m gold at the World Championships in London, retired from track racing this month. The four-time Olympic champion will now concentrate on the road, starting by defending his title in the world-famous half-marathon in North East England. "To win four in a row would be unbelievable," said Farah. "Winning just one Great North Run was a lifelong ambition. It's one of my favourite races in the calendar and I can't wait to come back to the North East." 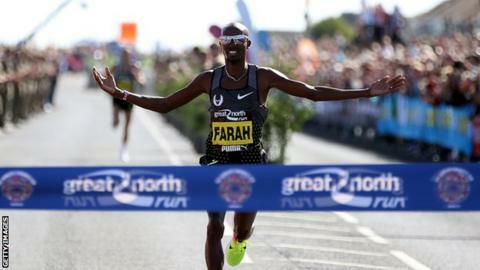 Farah has competed in every Great North Run since 2013, finishing second in his first outing before wins in 2014, 2015 and 2016. A fourth win would equal Benson Masya's record, with the Kenyan winning in 1991, 1992, 1994 and 1996. The Great North Run will be broadcast live on the BBC from 09:30 BST on Sunday, 10 September and you can watch it and follow live text commentary here. From training alone to 4,500-strong - these girls can run!